There's scant evidence that the Russians were behind DNC (Podesta) email hacks, and certainly not the leak to Wikileaks, or that they'd want Trump to win over Hillary. And if they were, that makes them guilty of investigative journalism and leaking the truth to the American public. There is lots of evidence of Democrats and media manipulating the election, lied to the public, and spread falsehoods about this hacking conspiracy theory to undermine the U.S. (and especially the legitimacy of this Presidency). (Gaslit those who questioned their narrative). And they used this attack as an excuse to distract away from their actions. Russia seems to have done what they've always done, which is spin things on RT, to try to manipulate our Press/public to inject moral ambiguity questions about our sides behavior versus theirs, and they attacked the frontrunner more than the challenger. That's hardly proof they wanted Trump to win, it's more proof they couldn't read the polls any better than Democrats did. And that's nothing new, and nothing different was done this election than any other -- or than we do to their and other elections. Obama spoke out about his hatred of Marie Le Pen, and his support of Emmanuel Macron during the French Election. He also sent staffers over to Israel to work against the re-election of Netanyahu. Are those high crimes and something we should prosecute Obama for? Because if it's not wrong for us to do it, then it isn't wrong for them to do it back. Pick one standard. They directly hacked our polling places - zero evidence of that - There's been multiple intelligence reports that said there was no attempts (let alone successes) at hacking any voting machines (what "hacking the election" means to the informed). They hacked our media and manipulated the public with propaganda and false information - zero evidence of that We can't even prove they were behind Assange (Wikileaks) telling the truth. Let alone any evidence that these leaks had a measurable impact on swing states. The FBI and others cleared Trump from being involved with the Russians on any of this, the only question was whether maybe some of his people talked to the Russians, or followed proper process during the transition. The continuing political witch hunt is who else made a procedural error in not disclosing completely legal discussions with the Russians. So at worst, the Russians were guilty of investigative journalism and leaking TRUE information about the Democrats and Hillary, and how THEY had actually manipulated the election, and how contemptuous of the electorate they were. Julian Assange (Wikileaks) and other sources came forward and said they got their evidence from a DNC insider (disgruntled Bernie supporter) that leaked, and not from the Russians: which makes sense since the timing was off. But whoever did it, we owe them our thanks and gratitude for helping to inform the public (and do the medias job for them). So while throwing shade on Hillary (who the Russians thought was going to win) might be fun for them, that's hardly "Hacking" an election. Everything else has been handwaving distractions orchestrated by the Hillary Campaign Machine and their allies in the media, to avoid the harsh reality that they lost the election, long before the emails were ever released -- and even if they hadn't, the Russians did America a public service by leaking the truth about the Democrats. 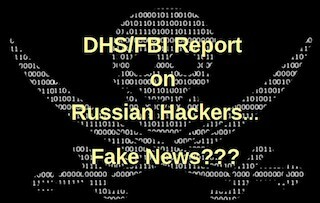 (b) even if the Russian did hack the DNC, that’s not proof that the Russians were the source of the Wikileaks material (especially since the FBI, Russia, Julian Assange, and a UK intelligence asset all agreed that Wikileaks was done by a DNC leaker and not the Podesta email hack). (c) And no one (least of all "intelligence sources") ever provided a good motive for why Russia would want Trump over Hillary. (e) letting out the truth about how the Democrats had manipulated the election (both primary and general) is more a public service than a violation of our democracy. In order for it to be a problem, you have to show that what they said was incorrect, and no one has demonstrated the emails were false. If telling the truth delegitimizes an election, then what does that say about our election in the first place? (f) If the Russians were hacking and they really wanted to harm the Obama or Clinton campaign, they could have done us a far bigger service (and more damage to the administration chances) by just releasing any of the following. So the argument that they were trying to manipulate the election means they either weren’t very good at hacking, or weren’t trying very hard to manipulate the election. (d) WaPo ran editorials about the sophisticated Russian hack. The FBI director had internally closed the investigation months BEFORE interviewing Hillary, and the FBI got caught offering a Russian Hacker a deal (money, free apartment, citizenship), if he'd falsely confessed to being the source of the hack, and many of the agencies that were credited with agreeing with national intelligence, said they never saw the evidence or signed off on anything. So far, no one has come up with evidence of a hack. 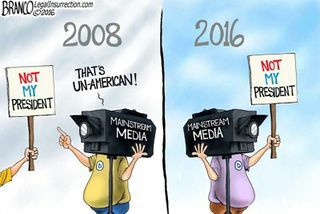 the DNC/Hillary Media machine first tried to sell that it was all old racist white males and deplorables that gave Trump the election, but some people can read exit polls and it showed that it was the young (not the old) and blacks, latinos and Asians that voted for Trump more than Republicans in prior elections. Read: Exit Polls. Rather than report those facts, they changed the topic. there were many fake claims of racism/bigotry by Trump supporters... but over time the truth will come out, that while hate crimes may have had a small blip, fake-hate crimes have had an astronomical leap. The media and democrats had been telling us during the Bush administration to never trust the CIA, were suddenly saying we should trust unnamed agency sources without evidence (and without question)*. the same CIA director that helped in draft the ill-fated Benghazi talking points (that the attack was a “spontaneous — not a premeditated” protest). These are the folks the media/Hillary Supporters were suddenly telling us to believe, while they were illegally leaking stories about Russians that no one would officially stand behind? And ignore the other intelligence agencies and evidence that disagrees? Also remember that there was a ton of evidence contradicting the Russian narrative, but that wasn't getting as much attention. Like UK intelligence asset that said he carried the leaks from a disgruntled Bernie supporter to Assange. (Shhhh). And finally the narrative is switching to Comey was at fault. Not for protecting Hillary from Crimes, or allowing the DOJ to illegally share information during an investigate in tarmac meetings about grandkids -- but because he admitted to the people that he'd found MORE evidence of Hillary breaking the law, and they were investigating excuses for why not to prosecute her for that. So we know the media/left was willing to go along with any of the administration/DNC narrative about how She should have won, but they were cheated (and thus a wild-eye’d conspiracy, was easier for them to accept than their own incompetence. And that's the fertilizer in which the "Russian" narrative grew. After 8 years of doing nothing about serious hacks or real threats to national security, suddenly Obama does his most aggressive foreign policy move (throwing out 35 Russian diplomats), just weeks before he left office, because of the possibility that they might have hacked the DNC and leaked the truth to the public. Hillary using a private email security in violation of the law (and that was likely hacked according to the FBI), wasn’t a problem for the media/Obama (despite secret, top secret and super-duper top-secret stuff being on there): nothing on it mattered. But her underlings, Podesta gets hacked and releases truths about the Democrat campaign (and how they were corrupting an election) and not anything vaguely related to national security, and that's a threat to national security? The strongest foreign policy signal the Obama administration ever sent to the world was: never, ever, tell the truth about Democrat corruption and abuse of power. This page was last edited on 14 April 2019, at 20:31.